A surprising amount of North Americans are not putting money away consistently for retirement. Many families are toeing the line of slipping into debt, if they aren’t already over their heads. With just one emergency such as a car breaking down or, in the US, a medical bill, many could be in a very precarious position. I know how hard it is to start saving. I have been there. In my early adulthood, I struggled to save money and even had to open up an account in my mom’s name for which I did not have the password, so that when I transferred money into it, I couldn’t just take it right out. That worked for a little while, but as an adult, I needed to be fiscally responsible for myself and learn some impulse control. As the time passed, I was able to figure out ways to save more money and stay on top of my finances. One of the first things that I implemented, when I decided that I needed to save more, was opening up a savings account (in my case, a TFSA which is now an investment account) that I could transfer all of my extra income into. Extra income for me meant anything that I earned above and beyond my full-time office job, from things like freelancing. I made it a habit to transfer the amount of my extra income into my account just for that purpose every single time I was paid, and I never missed it. I’m all about the small steps lately, because they work. Starting small and working your way up is very effective and you will see examples of its effectiveness everywhere you look. I put $25 per paycheck into my savings account every second Friday. I didn’t miss that $25 but it helped me get into the habit of transferring the money from point A to point B when I got paid. Combined with my extra income, this $600/year (give or take $25) really helped boost my savings and therefor my emergency fund. Four years after I started this, I’m now putting $650 from each pay period into my savings account, but that’s due to increased earnings; if you can increase it by a small amount maybe every quarter, you’ll see your savings grow. I’ve said it before and I’ll say it again: in order to make improvements, you have to start doing something – wether it’s starting a new habit or changing a behaviour. You can then build upon those small steps. I consider “found” money anything that is quite literally found (on the street, etc), or money that is gifted to you or comes to you in a way aside from income. If you sold something, for instance, on Craigslist for $30, put that into your savings right away. If you win a gift card to the grocery store, put the amount you’d normally spend on groceries in your savings account. Birthday or Christmas gifts, wedding gifts, or any sort of gifted cash should go straight into your savings account. You may be surprised as to just how much money is “found” over the course of a year, and it all helps boost your savings handsomely. If you come by some cash (such as small bills or change) and don’t want to have to go to the bank each and every time, start a change jar and go every few months. Saving money and putting it away for a rainy day is not rocket science. 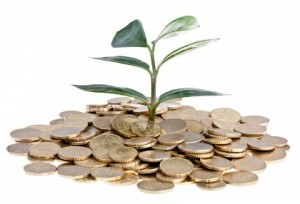 We make things far too complicated; start with these small things and watch your savings grow! I like the idea of automatically putting away a small amount of money into savings. Even though it seems almost insignificant, it adds up fast! We’ve been automatically putting money aside for funding retirement accounts for a number of years now. When everything is automated it’s surprising that you don’t even notice a difference. So true – you would never miss it. I love the idea about putting found money into savings. We do this a lot, especially with the children’s college funds. I also think it’s good to give away a percent of found money (like to a church, charity, or friend in need) because in a sense it’s not really mine.